Mixed flower and doll set in basket. 10% Off for this item. - This item is available for the delivery in Bangkok only. For delivery in other cities/province, please ask us before placing order. - Dolls are the same with example photo. 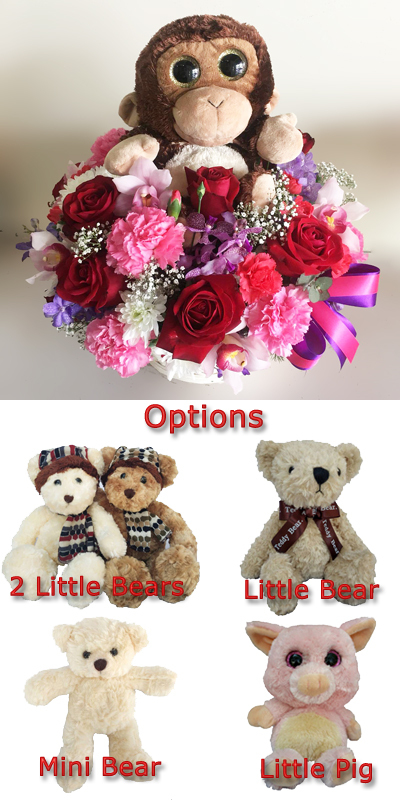 To place order, please choose arrangement option and then click on Add to Cart. 1) When you are at the shopping cart page, please enter your greeting card message to accompany with the flowers or gifts. 2) When you are at the payment page, please provide us the shipping address (your recipient’s address in Thailand) and please provide us the valid telephone number of your recipient. We will call the recipient in the event of there is delivery problem such as we cannot locate the address or the recipient is not there. 3) The shopping cart system can accept only Western “qwerty” keyboard characters (English letters). Please send us e-mail at info@changflorist.com if you want to send information in Thai. This Web Site is registered with the Department of Business Development, the Ministry of Commerce of Thailand.